India currently has only three proper tracks where both drivers and riders can rejoice and open throttle/pedal to the metal without worrying about pedestrians or speed fines. Normally owners buy high-end sports cars or sports bikes, track-ready them till a certain degree and are all good to go, but what if you wanted a race car from your desired manufacturer without having to go through the hassle of making one yourself? Well, listen up all you four-wheeled enthusiast because Volkswagen Motorsports India is planning to sell their tracks spec race cars to individual owners. 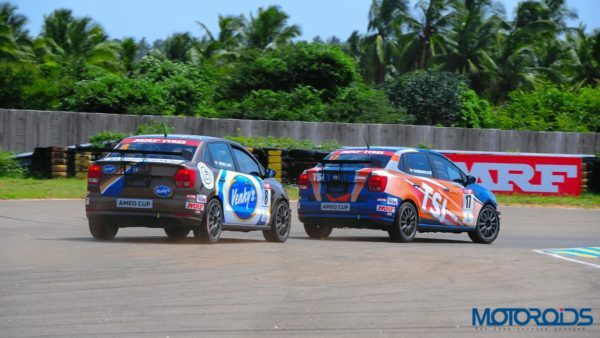 Volkswagen has been doing track cars ever since they started with their Polo, then the Vento and Ameo followed as they too were transformed into race-spec cars. Buyers can choose between either the race-spec Ameo and Vento, but first, let’s give you a little background about these cars and what makes them so special. 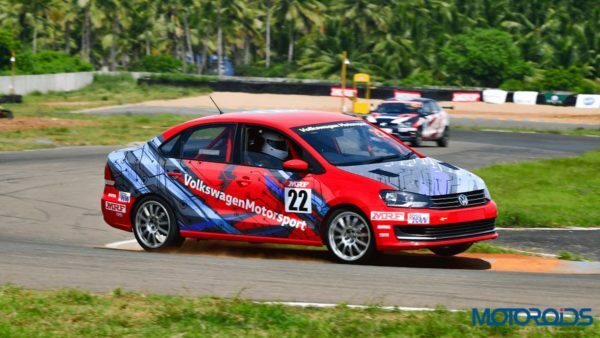 The Ameo is used by Volkswagen Motorsports for the Ameo Cup races and it features 1.8-litre motor that produces an insane 205 bhp of power. Additionally, this motor has been equipped with a BMC intake system along with a race-oriented sequential gearbox that also gets a full auto mode. For those of you that don’t know, a sequential gearbox is what you’d normally find on a motorcycle, where the gearshifts are extremely quick and leave no room for finding yourself in the wrong gear as you bang through them one at a time. The engine management and the data logging has been carried out via a Motec setup, the Ameo is also equipped with an all-digital instrument cluster. Traction has been taken care by MRF ZLO race rubber that’s wrapped around wheels by Team Dynamics. To help hold yourself in place the Ameo gets an OMP race seat, but when it comes to safety this isn’t high on any airbag count. Instead, this gets an FMSCI certified race spec roll-cage, a fire extinguisher and a seam welded body structure. For additional traction, there is a large rear wing that delivers plenty of downforces and allows the Ameo to put down a lap time of under 2:20:000 around the Buddh International Circuit. What’s the cost of all this you ask? Well, Volkswagen is pricing it at Rs. 40 lakhs and it will most likely be a track only car and will not be road legal. The Vento on the other hand also has a 1.8-litre motor that produces 210 bhp of power, but that’s because of the ITC spec restrictor plate. However, without the restrictor, it produces a massive 250 bhp of power which is just all kinds of nuts. Additionally, it can be had with either a sequential gearbox with a manual shifter or an H-Pattern 6-speed transmission. 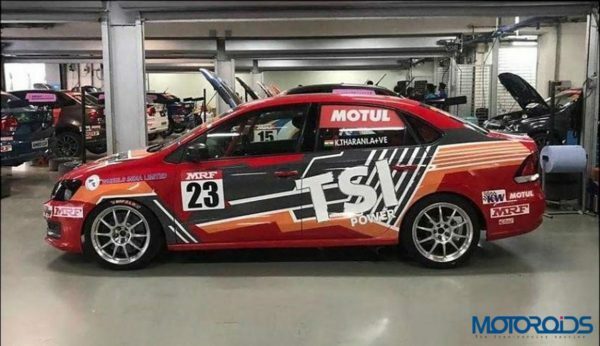 Volkswagen Motorsports uses this bad boy for the Indian Touring Car Championship, rest assured you know this too gets a race-spec roll cage, fire extinguisher, along with race seats & harnesses. Suspension duties are taken care of by KW that are mated to Eibach springs for extra cornering stability. The race-spec Vento gets a set of specifically made forged wheels by Wheels India Limited and weighs in at just 6.5 kgs each which are quite light and help deliver more agility. The Vento gets huge brakes that offer phenomenal braking thanks to the race brake pads, the front brakes are sourced from a Volkswagen Golf R32 while the rear is sourced from an Octavia RS. The large rear wing that’s found on the race-spec Ameo isn’t available on the Vento as standard but can be had for an optional extra. Additional aero parts like a front splitter, rear splitter along with a set of canards for the bumper can be had on the Vento, Volkswagen Motorsports is also offering a different ECU map that grants the car a total of 300bhp!! Now if that isn’t bonkers then we don’t know what is, Volkswagen Motorsports is selling the Vento for Rs. 24 lakhs (without additional options) and Rs. 40 lakhs for the additional options mentioned above. Truth be told these cars sound like a bargain for any track day lover who is looking for vehicles whose sole purpose is tearing up the asphalt.